Long Island brides love the beach and nothing captures the essence of that on your wedding day quite like a beautiful sunset wedding picture. There is just something so amazing about a sunset over the Long Island Sound on a warm summer evening! This particular picture was taken on the sand beach in front of the Crescent Beach Club in Bayville, New York but could have been taken anywhere along this strip of beach on the North Shore of Nassau County, Long Island. A similar sunset image appears on this web site that was taken in front of Wall’s Wharf, a more casual venue that shares the same spectacular view. The waterfront venues of Long Island, NY are some of the most popular establishments for wedding receptions and I have experience creating great wedding pictures at all of them including: The Bridgeview Yacht Club in Island Park. Chateau La Mer in Lindenhurst. The Bourne Mansion and Land’s End in Sayville. Lombardi’s on the Bay in Patchogue. Oceanbleu at the Westhampton Bath and Tennis Club. Gurney’s Inn, Montauk Manor and the Montauk Yacht Club. Lombardi’s on the Sound in Port Jefferson. The Harbor Club at Prime in Huntington. 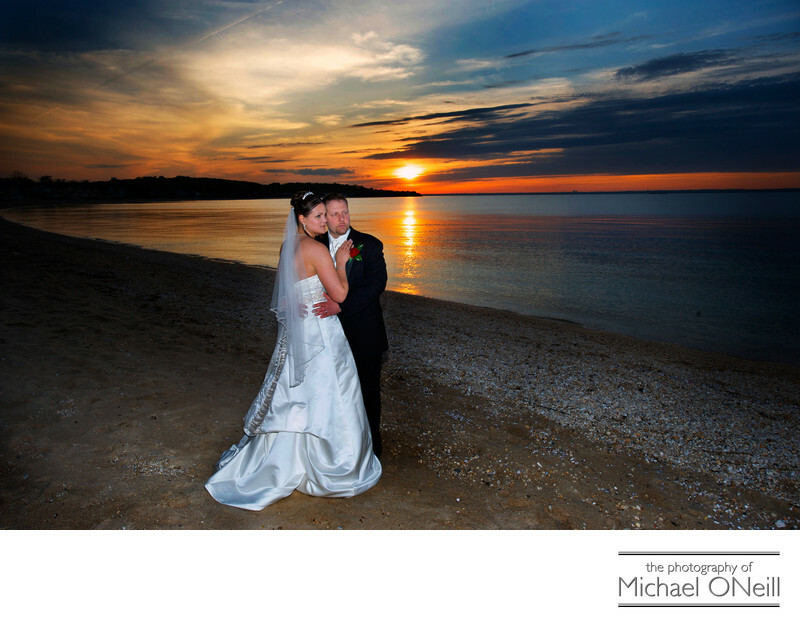 If you are planning a waterfront wedding here on Long Island and would like to create an awesome sunset photograph with Long Island’s best wedding photographer give a call to our East Northport, NY studio and gallery. We would love to talk to you about your plans for your big day.